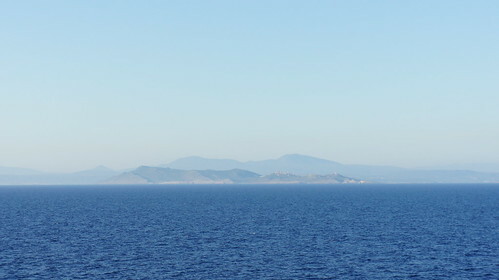 Day at sea between Dubrovnik and Athens. Another morning doing about a mile around the jogging track. 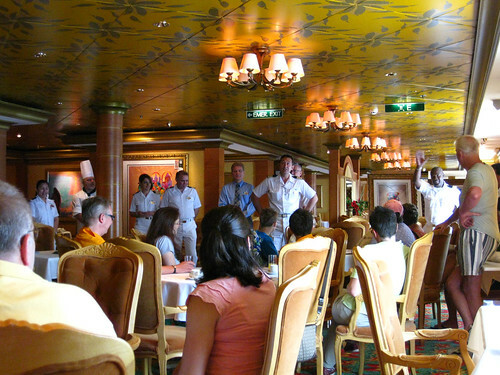 Later in the day, ship’s officers host a Cruise Critic member meet-and-greet in Le Bistro, the ship’s French specialty restaurant. Almost immediately after the meet-and greet we go up to the Spinnaker Lounge to attend a cocktail party for members of Latitudes, NCL’s rewards program, automatically open to repeat NCL cruisers. After a welcome from the ship’s officers (we’re seeing them a lot today) there are free drinks, live music, a decent standup comedy act from one of the officers, and door prizes. 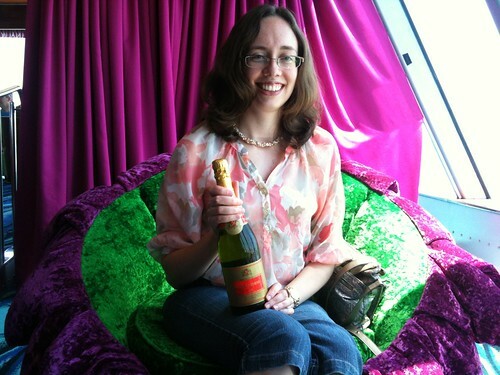 Amy wins a bottle of sparkling wine. We spend the rest of the sea day exploring the ship, and alternating between sunning ourselves on the sun deck and dipping in one of the ship’s two saltwater pools. (The forward pool is adults only — deeper and free of screaming children.) A Filipino musician with a guitar provides live music from between the pools — John Denver’s “Country Roads.” Then, back to our cabin to shower for dinner, and later hang around on the balcony to watch the sun set and the moon rise while the Greek coast slides by. Full shipboard cruise photoset on Flickr.